Charles D. Rupp, 84, of Kittanning, Pennsylvania, died Wednesday, Oct. 10, 2007. Friends and family will be received from 7 to 9 p.m. Friday and 2 to 4 and 7 to 9 p.m. Saturday at the SNYDER-CRISSMAN FUNERAL HOME in Kittanning. Funeral services will be held Sunday. 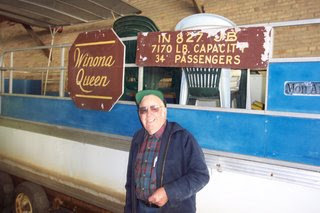 Rupp (pictured) was featured on this blog in June of 2006 as the individual who “rescued” and re-activated the “Winona Queen” pontoon boat that previously was used on Winona Lake, Indiana. Rupp’s three children, Chuck, Carolyn, and Gladine, all are Grace College alumni, as are a number of his grandchildren. Gladine is married to Larry McCall, pastor of Christ’s Covenant Church in Winona Lake. The Rupp family has long been affiliated with the Grace Brethren Church of West Kittanning, PA (Mark Cornwell, pastor). Pastor Larry McCall said, “Although nearly 85, he had not retired, and died of heart failure doing what he loved to do–working on a project at one of his properties. Charles David Rupp, 84, of Kittanning, died Wednesday, Oct. 10, 2007, in the outdoors, where he loved to be. He was born Jan. 3, 1923, in Armstrong County, the son of the late George Barthelow, who died in 1972, and Elva Naomi (Hetrick) Rupp, who died in 1996. He married Ruth Naomi Saxman, who survives, on April 6, 1951, in Putneyville. They celebrated their 56th anniversary this year. He attended Hoover, Goheenville, Reeseman and Kittanning high schools. He started Rupp’s Appliance in his father’s wagon shed on the family farm near Goheenville in 1946, and eventually built the current store in West Kittanning in 1958. He enjoyed spending quality time with family and friends at his family’s camp along the Allegheny River near Templeton. He created a legacy by his example. He taught, encouraged and inspired his family to be hard workers, responsible citizens, good friends and devoted to family. He worked hard at every task set before him, enjoyed his work, loved his family, voted in every election, laughed, joked, played and enjoyed music. He reveled in the beauty of God’s creation and thoroughly enjoyed helping others have a good time. He will be deeply missed by his grateful family and devoted friends. Chuck was a 33-year Coast Guard Auxiliary member, a 60-year member of the Free and Accepted Masons New Bethlehem Lodge 522, New Castle Consistory member, Syria Shrine member and a West Kittanning Fire Department honorary member. He loved his community and was involved in the Kittanning Chamber of Commerce (past member and secretary), Armstrong-Indiana Beekeepers Association. (member and past president), PA and International Carwash Association., PA Campground Owners Association, Indiana-Armstrong Builders Association, and was a former Cub Scoutmaster. Chuck and Ruth have three children, Gladine (Larry) McCall and Carolyn (Robert) Rex, both of Warsaw, Ind. ; and K. Charles (Pamela) Rupp, of Kittanning. Also surviving are nine grandchildren, David (Ken) McCall, Janelle (Joshua) Armstrong, Laura (Jacob) Barros, Jamie (Jon) Whirledge, Jenny and Bobby Rex, all of Warsaw, and Andrew, Danielle, and Joshua Rupp, all of Kittanning; one great- grandson, Jonathan Brady Whirledge; brother, Merle J. Rupp, of New Bethlehem; sisters, Larue Williams, of Dayton; Alda Powell, of Goheenville, and Margaret Light, of Lisbon, Ohio, and numerous nephews and nieces. In addition to his parents, he was preceded in death by a brother, Glenn, in 1988. Calling is from 7 to 9 p.m. Friday and 2 to 4 and 7 to 9 p.m. Saturday at SNYDER-CRISSMAN FUNERAL HOME in Kittanning. The funeral service will be at 3 p.m. Sunday in Harvest Community Church, 143 Reed Road, Kittanning, with his son-in-law, Pastor Larry McCall, officiating, assisted by Pastor Mike Grenier, lead pastor of Harvest Community Church. Additional visitation will be held at the church one hour prior to the funeral service. Burial will be in the Belknap Cemetery. Memorial contributions may be made to the Armstrong County Community Foundation, 160 N. McKean St., Kittanning, PA 16201 in memory of Charles D. Rupp.